You’re cruising down the highway listening to the latest AoM podcast when your car’s “check engine” light blinks on. When you take your vehicle into an automotive shop, the mechanic tells you that the problem is a catalytic converter in need of replacing. And oh, while he was poking around he also noticed the car’s air filter ought to be changed and you’re due for a steering flush as well. Are these operations really necessary, or is the mechanic trying to needlessly upsell you? You’re not sure, but figure it’s better to be safe than sorry, and you sign off on all the repairs. When you pick up your car and pull out of the parking lot, you’re just getting over the sticker shock of the huge bill when…the check engine light comes on again. There are plenty of competent, honest mechanics out there, but like any profession, there are also some bad apples who have no druthers about putting in subpar work and ripping you off. Every man should know how to sort the former from the latter. A good mechanic can save you a tremendous amount of headaches and money and is thus a valuable asset to have in your metaphorical Rolodex. How does one find a trustworthy automotive professional? I talked with a few car mechanics to find out and share their recommendations below. I know that when I go to a mechanic, and they tell me some system needs flushing, or a belt needs replacing, or something looks worn, I usually just kind of nod along like I understand what they’re talking about. Inevitably, I don’t. And I’m guessing a lot of guys do the same. You don’t want to come off as an automotive ignoramus, so you just act like you know the parts and the repairs needed. So the first step in finding a good mechanic, before you even talk to friends or look at Angie’s List, is to know how your car operates. Brett is helping with his Gearhead 101 series, but you’ll need to do some research of your own too. Google is a treasure trove here, and you can even get make/model specific. A quick search of “how a car works” leads to dozens of helpful results. Also head to the library and find a children’s or teen’s book that explains cars; it’ll be far more useful to you than a thick manual or textbook that you won’t be able to read. Finding an honest mechanic is partly about being able to keep the mechanic honest. Knowing your vehicle and how it operates is your first line of defense. 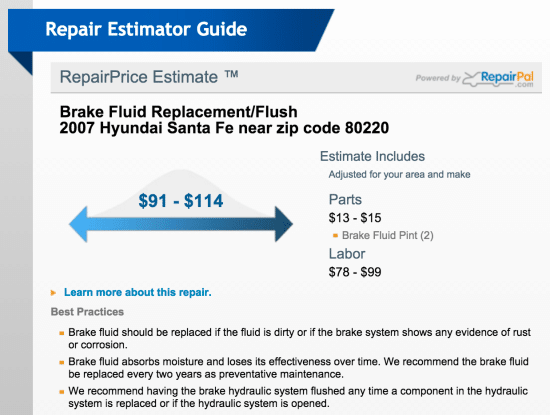 So you know a little bit about how your car works, but how are you supposed to know if you’re getting a good deal on a repair? How can you compare one shop to another, and know if a price is fair or a rip off? And how long should the repair take, on average? All mechanics will charge more for a part than what you’ll pay for it, on say, Amazon, but shady ones will grossly inflate it. They’ll also charge you for “gravy work” — billing you for two hours of repairs that really only took 30 minutes. To prevent being ripped off, do your homework. Here again, Google is your friend. Do a search for the repair needed, as well as your make, model, and year. You’re sure to find forums of folks who’ve had similar work done. Find out how long a repair typically takes by a competent mechanic. Look for a price near the middle rather than outliers at the top and bottom end. That should give you a decent idea of a fair price. The Napa auto repair estimator. Another route is the Napa estimator. This tool uses make, model, year, and zip code (to account for geographic and regional differences). It also gives a good description of the repair and best practices that the shop should be using. Once you know an average baseline for time and cost, call around to different shops and ask for an estimate. If it’s a common repair, they should be able to give you an idea of what it’ll cost and how long it will take. Some shops will put the estimate in writing for you upfront. When looking for recommendations for a good mechanic, first ask your immediate local network. Ask your Facebook friends, ask the guy next door, heck, even ask your mailman if you want. Reviews from real people who you trust will always be more useful and beneficial than anonymous online critics who may have a baseless axe to grind. Ask folks about their experiences with various shops around town. Did people feel they could trust the mechanics? Were repairs done in a timely fashion? Were they up-sold like crazy, or did the shop focus on the requested repairs? Did they have any issues with their car after the repair had supposedly been made? Knowing the answers to these questions, from people whose opinions you trust, will go a long way in helping you find a reliable and honest car mechanic. After you’ve spoken with your own network, then consult online reviews. Angie’s List, Yelp, and Google listings are the most helpful. As with any online review, take it with a grain of salt. Generally discard the best review and the worst, and see what folks in the middle are saying. While it’s nice to be able to go to a dealer that specializes in your make of vehicle, you’ll typically save money by taking your car to a local, independent shop. While it’s perfectly fine to choose one that works on all makes and models, there are a couple downsides to consider. One, mechanics aren’t able to be specialized in a particular make, meaning they’re more likely to be consulting manuals and guidebooks rather than just knowing offhand the subtleties of how your car functions and operates. Second, they’re far more likely to need to order or courier in parts for your car rather than having them on-hand, making the repair time longer. Taking your vehicle to an independent shop that specializes in its make will remedy these issues, though this option has its own downsides. You may not be able to find a specialty shop that’s conveniently located to where you live or work. It may also be a little more expensive since you’re paying for additional expertise. It’s still probably less than a dealer though, and for a small additional cost in price and convenience, you’ll likely have a better job done. While certifications aren’t everything, they’re one indication of how seriously a shop takes its professionalism and training. If the shop is certified, it tells you that another organization has done some vetting for you, and gives its stamp of approval. For technicians, the ASE certification is a way to show that they have relevant hands-on experience and have passed various tests about automotive functions and repairs. Some shops require their technicians to be certified; feel free to call ahead and ask about this. If a mechanic doesn’t have this certification, it doesn’t mean they aren’t competent; it’s just one other thing to look at and consider when making a decision. You’ve found a shop that you’d like to give a try; what do you do next to test them out? The mechanics I talked with said you should start with a small, routine job. Go in for an oil change or a routine inspection. Just like with your health, it’s better to build a relationship with a doctor through regular check-ups and maintenance, than to try to find a new doc when something major needs fixing. After the job is complete, do an assessment of the experience. Did you feel you could trust the mechanics and the other employees? Did the price seem reasonable? Did they try to up-sell you a bunch of other services? Was it quick? (An oil change shouldn’t take 3 hours.) If this first experience was positive, you can start to trust them with bigger repairs. When you walked into the shop, how did it look? What was your first impression? Was it clean? (Relatively speaking, of course, it’s still an auto-repair garage.) Ask to see the actual garage. Is it well lit? Are the tools neat and organized, or scattered about? How’s the parking lot? Are cars seemingly haphazardly parked in various places? (I’ve seen this before many times.) Or are they arranged and dealt with in a way that makes it easy for the customer when the repair is done? When you get the car back, were there protectors placed on the seat and on the floor? Were there smudges on the door handle and steering wheel from dirty and greasy hands? (I’ve had this happen, but only at one shop. Didn’t go back there again.) Yes, it’s an auto garage and things are naturally going to be a little dirty and greasy. On the other hand, how they present themselves to their customers, and how they’re organized in the back says a lot about their professionalism and work ethic. Wow, these are really helpful tips to finding a good mechanic! It is definitely important to establish a relationship with your mechanic, and it’s always nice to make a new friend too!